Any enterprise can look at everyday work tasks of their employees and see opportunities for performance support tools. What kind of performance gaps is happening? Maybe it is a sales representative that doesn’t have an easy way to get competitive information right before an important client call. Or it is an assembly line worker that can’t recall how to respond to a particular warning indicator on a piece of machinery on the plant floor. An important goal of performance support is to deliver the right information within the context of the situation. That means you need to have a good understanding of employee workflow. Just exactly what kind of information is needed in this on-demand type of situation? 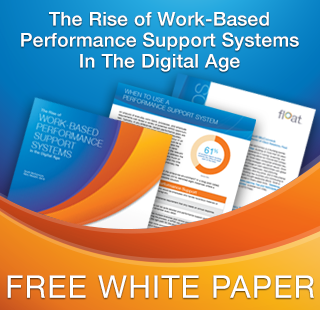 In Float’s recent white paper, The Rise of Work-based Performance Support Systems in the Digital Age, a variety of circumstances is listed when to use a performance support system. It gives these in a table from a blog post by Connie Malamed called, How to Get Started with Performance Support. She identifies eight instances where a performance support tool has great potential as a possible solution. Note that many of these examples result from the disconnect between the instance when employees learn information and then when they need to apply it. We already know employees have trouble keeping content no matter how “engaging” we make our training. The answer is to stop relying on their memory and give them the applicable facts when they need it. Let’s look at Connie’s list and examine circumstances when performance support delivery is more effective. 1. When accuracy is critical, and errors are risky. There are many careers in which employees are working in dangerous situations. People who deal with hazardous chemicals, on surgical teams, first responders to disasters – there may be something in your company that has a critical component to it. How can you integrate important information to these key performers? Perhaps it needs to be hands-free, such as on a smart watch or glasses. Steps on a checklist could appear in response to verbal cues. Use technology to equip your positions that include risk. 2. When a work task is performed infrequently, making it difficult to remember. 3. When a work task is error-prone, so that mistakes are made too often. Ms. Malamed provides a good example of this performance support need by mentioning routine medical procedures in a hospital. Thinks of the steps needed to apply an IV needle to a patient. Why not have these steps easily accessible on mobile devices including pictures and even video on how to do it correctly? 4. When there are multiple decision points or many steps. Have you ever built training for overcoming customer resistance? For a salesperson, this is commonly needed information. Or if there is a customer-facing encounter that has a myriad of outcomes. Why not step through a decision tree with the customer that leads to accurate offerings? The customer will appreciate it, and the potential for a sale is increased. Think of an investment advisor who has a wide range of possible advice using this approach. 5. When procedures or tasks are changing. Float has had the opportunity to work with clients who have many “big box” retail outlets around the company. The product lineup for these stores changes on a daily basis and the support information related to the products changes as well. It can be a daunting task for a salesperson to keep up with it all. Present product information that is easily searchable on a mobile device and even use the device’s micro-location capabilities to guide the employee to the right spot on the sales floor. 6. When the workers have a low level of literacy. Do you have employees that struggle with English as a second language? Utilize the device’s technology to solve some of these language barrier problems. Applications such as Google Translate allows you to point the phone’s camera at printed text and then see the same text in another language on the device display. There is also voice recognition software such as Speech longer that can translate your spoken word as you dictate it. Are there ways you can integrate these technologies into your performance support tools? 7. When training is not available for performing complex tasks. We hear from many companies that a wealth of knowledge for their workers is locked up in the heads of veteran subject matter experts. There have been some creative solutions to this dilemma by SME’s sharing knowledge via video streaming through smart glasses. Take a look at this video where an SME solves a problem with the onsite technician by utilizing smart glasses. 8. When there are budget constraints, even though training may be a better alternative. For the creative training professional, you may even be able to find a free alternative in the many mobile applications available in app stores. I once created a mobile checklist using the mobile application Steller to show how easy it is to develop mobile learning. 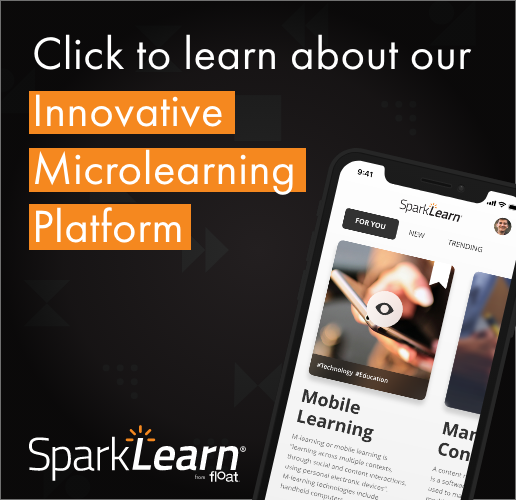 Download the app and look for “ScottFloat” and you will find “10 Essentials for Successful Mobile Learning.”, which you can also find here on Float’s website. It’s simple and fun, but you will get the point. Most of these examples given above cause you to reimagine how to deliver information to the enterprise. What kind of content do your employees need at the time of need in their daily workflow? Get down to the shop floor and in the cubicles and up to the C-Suite, and determine where the real performance gaps are. Then, fill them with creative mobile solutions that take advantage of today’s technologies. And be sure to get your hands on Float’s latest white paper by clicking below. What are some good examples of performance support tools that you have seen in the workplace lately? Share your examples in the comments.